Off-Topic invites artists, curators, writers, and cultural workers to discuss a subject not directly related to the practice of making art. We would like to welcome Stephanie Burke as our latest guest with her post, “Firestarter”. 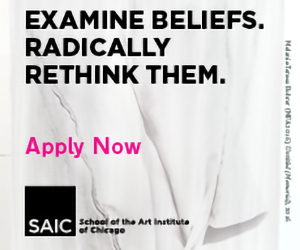 Stephanie is a Chicago based photographer who graduated from the School of the Art Institute of Chicago in 2009. She currently writes for Bad at Sports, runs Art Talk Chicago and works as the Managing Editor for Chicago Art Magazine. Last night I had a dream: my husband and I were living in an abandoned church in some metropolis. The church was high on a hill overlooking the city. I was sitting in the scrubby grass outside the church, watching the sun go down and listening to talk radio. An announcer cut into my program, saying the mayor had decided to start shutting the power off at night to save money. I looked out over the city to the west, and watched the lights blackout below me as the sun dipped below the horizon. As the last rays of sunlight disappeared, I started thinking about how I was going to build a fire without drawing attention to myself. In mid-thought, I woke up. I rolled over and related my dream to Jeriah, including my quandary as to how to build an un-noticeable fire. Without skipping a beat, he said flatly, “a Dakota Fire Hole, that’s what you’d use.” Yes, that’s what I would use. Knowing how to build things like a Dakota Fire Hole, and a fire in general, is an important part of wilderness and disaster preparedness, a topic of great import to me. Thus, I have decided to dedicate my Bad at Sports Off Topic entry to fire building in context of survivalism. Fire is one of the most important things you will need in a survival situation. Fires provide heat to dry clothes, warm bodies, cook food, and boil water to destroy pathogens. It also provides light to work by, to use as a signal for rescue, and to aid in general peace of mind. For all these reasons, you need to plan ahead and understand the basics of starting and maintaining fires. First, you need to understand the needs of a fire. A fire needs three things: fuel, air, and an ignition source (or spark). Fuel is what is feeding the fire, usually in the form of wood, paper, leaves, twigs, etc., and generally, the drier the fuel the better. Overly wet fuel can be used once a fire is going, assuming it has been dried out near the fire before use, or the fire is raging extremely hot. Be careful when gathering your fuel, many parks and wilderness areas have restrictions on wood gathering. There are three main fuel types you need to gather: tinder, kindling, and denser, long burning material. Starter and kindling are essential to starting a fire (without gasoline or road flares), and it continues to surprise me when a watch people try to start fires without them. If I had a dollar for every time I’ve seen someone crumple up 2 wads of newspaper, cover them with 4 or 5 four-inch diameter logs, then light it expecting a the newspaper to get the logs going, I’d have, like, a few hundred dollars. Tinder is quick-starting, fast-burning fuel. 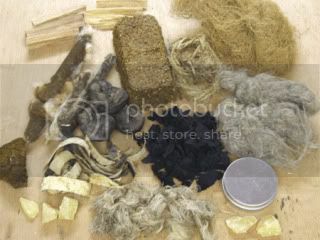 Common tinder includes: newspaper, toilet paper, dry grass, dry leaves, tiny twigs, birch bark, tinder fungus, fat wood, shaved magnesium (which functions as a primary tinder to ignite a secondary tinder, such as paper, from a spark), cattail fluff, pocket and dryer lint, and a fuzz stick (created by shaving the edge of a stick to feather it, while leaving the “feathers” attached). Less-common tinder includes a cotton ball covered in Vaseline, steel wool, a commercial product known as Liquid Match, bird nests (be sure they are no longer in use), and dollar bills. This is a good justification for carrying around a few singles. In a survival situation, you’ll use anything you have to start a fire, including money, the question is, how much do you want your fire to cost? The essential step between tinder and large fuel that most people forget, or at least fail to get enough of, is kindling. 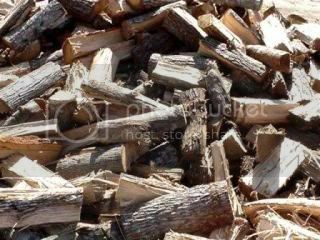 Kindling is at the little-to-medium sized stuff that keeps the fire burning and the coals building until the fire itself can sustainably catch and maintain fire on medium-large to large logs. 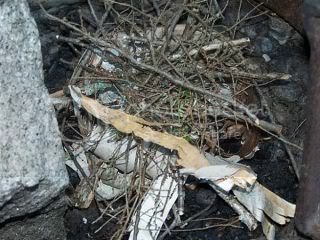 Commonly, kindling consists of twigs and chopped up bits of larger logs (especially from the inside of logs, as this wood will generally be drier). You can also use: pine cones, wood doused in combustible fluids, heavy cardboard, small bits of plastic (only in an emergency of course, as burning plastic is rather toxic), When collecting kindling for a fire, be sure to get a wide spectrum of sizes between roughly match stick size to 1″x2″x1’s, and if you are new to fire building, gather about three times what you think you’ll need. Remember, it is kindling that forms the basis for your fire. Without a good, hot kindling fire, your tinder will quickly burn out, leaving you with a face full of smoke, and some decidedly non-warming logs. The final step is the fuel. This is made up of heavier material that will sustain the fire for as long as you need it. Any number of materials can be used as fuel, dense, dry hardwood being ideal. You can, however use, whatever is at hand, just make sure you gather as much as you need before the sun goes down, you don’t want to be stumbling around in the dark looking for wood as your fire is going out. An important thing to know, as mentioned, is that fuel doesn’t have to be perfectly dry. Even relatively wet logs will burn, if the fire is hot enough and the wood has been allowed to sit around the fire and dry slightly before throwing it on. Air is absolutely essential to a fire. Without air, a fire smolders, smokes, and goes out. Thus, when building a fire, you must provide space or conduits through which air can reach the fuel. 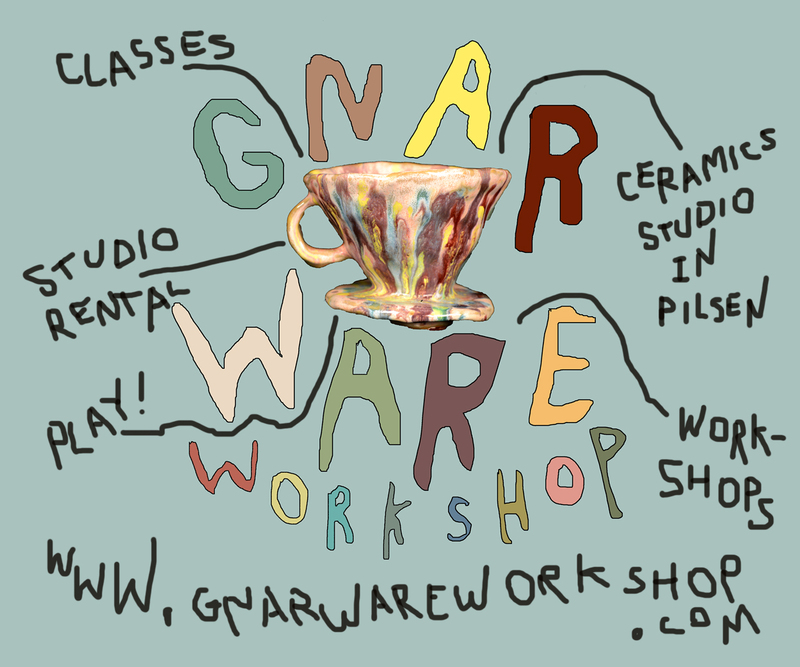 This is another common beginner’s mistake, throwing on too much fuel in too thick of a stack. There is a variety of fire building styles, roughly arranged into three types: the teepee, the log cabin, and the pit fire. There are also more exotic types, appropriate to specific situations, but we won’t concern ourselves with those here. First, the teepee. 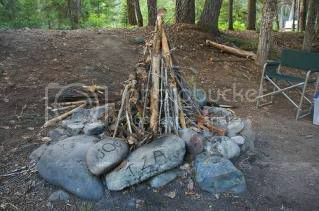 This is my preferred fire building style. Just like it sounds, the teepee style fire consists of leaning kindling and fuel around your tinder, leaned into a point in the center. The advantage of this type of fire is that it keeps the fuel directly in the path of the flame (since the flame goes up), and as the fuel burns, it collapses into the center of the coals. When building log cabin style, you build as would seem obvious, in log cabin fashion around the central tinder and kindling. For this type of construction, you must get an extremely strong fire going in the center to get the “cabin” burning. With both the teepee and log cabin fire types, you want to try and build in an area away from the wind, or with at wind block consisting of a large log or stone on the windward side of your fire. Also, be sure to build your fire on solid, flat earth, with at least three feet on every side from combustible material and away from overhanging branches, leaves, etc. The third fire type, and the one I mentioned at the beginning of this article, is the ideal type of fire in extremely windy places, situations in which you want to cook continuously over your fire, or a situation in which you don’t want to be seen. 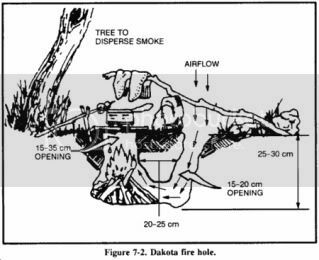 Known as the Dakota Fire Hole, it consists of digging a pit for your fire with a tunnel/flue. In order to dig a Dakota Fire Hole, you need to be in an area where you can dig easily, with little seepage issues. Dig a hole, about a 1′ deep, 1′ wide at the mouth and about a 1 ½’ wide at the base of the pit. Once you have that, start another hole about 6″ wide about 1′ from the edge of the main pit, on the windward side of the pit. Dig the 6″ wide tunnel downward at and angle so that it enters the fire pit at the base. You can place a grate over the main pit to cook on, and the fire will cook hot and clean with little fuel. Now, it’s time to start your fire. Think of building and maintaining a fire as a continuum, from spark to glowing coals. First, let’s talk about the spark. There are many ways to provide the necessary spark to start a fire. The answer may seem obvious: matches or a lighter. These are the old stand-bys, and you should never be without them, even if you do not smoke. 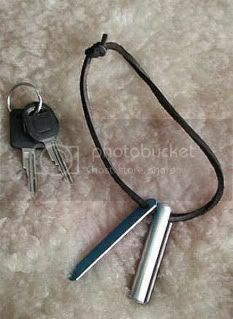 You never know when it will come in handy, from an impromptu BBQ or backyard bonfire, to simply being someone’s hero when they want to have a smoke but need a light. If you carry matches, keep them dry (or carry waterproof matches). If you carry a lighter, keep an eye on the fuel level and refill (in the case of a Zippo) or replace (in the case of a Bic). Don’t forget flints if you opt for the Zippo. 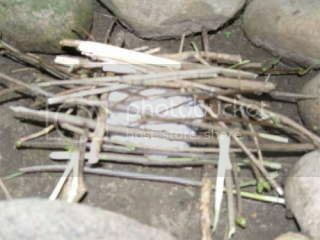 Matches or a lighter are the best and easiest way to start a fire, but matches get wet, and lighters run out. It is therefore smart to have a back-up plan. 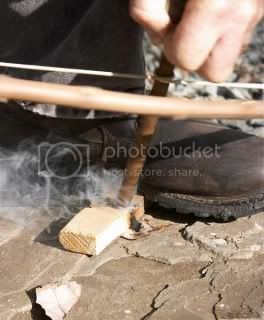 Probably the most common survivalist fire starting method involves a magnesium and ferrocerium fire-starting rod. Using this method, you buy the afore mentioned combo stick, shave off some of the magnesium, then use a steel on the ferrocerium to spark the magnesium. Other exciting methods include: touching a nine-volt battery to steel wool (by far the most awesomely weird way to start a fire), polishing up the bottom of a coke can with some chocolate bar to make a reflector (the most MacGyverish way to get your fire going), lava (good in Hawaii, I guess), and any number of old-school fire starters like the bow-drill, hand-drill, and fire board. The ability to start a fire is a skill set humankind has possessed for tens or hundreds of thousands of years, and is still relevant today. In the unlikely event that you find yourself in a survival situation, it could save your life. Under more ordinary circumstances, it can bring life to a party, or cheer up a camping trip. As winter draws near, the proper use of fire can extend the outdoor party season. Unfortunately, many people today have forgotten how to properly build a fire, and you might be surprised just how much it will impress your friends, if you simply apply the lessons of this basic guide.